The city of Rio de Janeiro is very well connected. Internet access can be found all over, even in the favelas or slums of the city. Very popular place in the city to visit is the Internet cafe. There are many of these cafes located throughout the city. They offer coffee, sandwiches and snacks along with electronic services. Computer options vary throughout the cafes. They all offer internet access but other services will differ. Each café has its own set of services in conjunction with Internet access. There are printers, faxes and scanners available for use as well as Webcams and VoIP. Other cafes offer multimedia computers with high speed internet access. Typesetting may be available as well as CD/DVD writers. Some cafes can be set up for video conferencing. Other cafes have a specific area set aside for computer gaming. Most Internet Cafes open at either 8am or 9am in the morning and stay open until around 8pm or 9pm at night during the week. On Saturdays hours are usually 9am to 3pm and most cafes are closed on Sundays. There are a few exceptions to these hours. For example, Copa Cybercafe stays open until 10pm every night. Prices for an hour on the Internet range anywhere from R$3.00 up to R$10.00 so it does pay to shop around. Most hotels also offer internet access but check the fees before you plug in, as they could be exorbitant.The government of the cityand state of Rio de Janeiro has set up wi-fi networks throughout the city so you can lug you laptop or your cell phone, by tracking the point of a free wireless connection and making a brief registration to gain access to the Internet quite easily. The state free wi fi networks covers the edge of the Zona Sul of Rio, Copacabana, Leme, Leblon and Ipanema beaches, and part of downtown, from Cinelandia to Presidente Vargas Ave.Rio de Janeiro is definitely in the forefront of computer technology. The whole city is wired for Internet and gaining access can be a simple matter of just walking down the street to the local café. 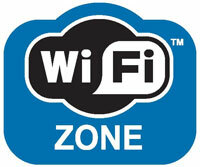 There are malls like the Shopping Leblon and Rio Sul offering free Wi-Fi. See below a sample of a list of places that has wifi - remember to double check once you go, as this places are subject to change.